Divide spheres. 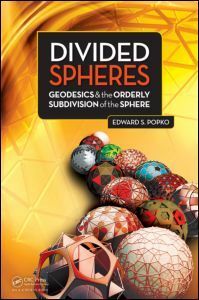 Geodesics and the orderly subdivision of the sphere Popko Edward S.
Auteur : Popko Edward S.
This well-illustrated book is the first comprehensive yet accessible introduction to the mathematics of Buckminster Fuller--s invention of the geodesic dome fifty years ago, which paved the way for a flood of practical applications in construction and other areas. Geodesic applications now encompass everything from product and packaging design, civil engineering, virology, nanotechnology, computer graphics, climate modeling, supercomputer architecture, wireless mobile networks, virtual reality gaming, astronomy, and computer-aided design (CAD). Divided Spheres. Bucky's Dome. Putting Spheres to Work. Circular Reasoning. Distributing Points. Polyhedral Frameworks. Golf Ball Dimples. Subdivision Schemas. Comparing Results. Computer-Aided Design (CAD). Advanced CAD Techniques. Appendices. Bibliography. Index. Mathematicians, computer scientists, graphics designers, civil engineers, and architects; general science and math readers.